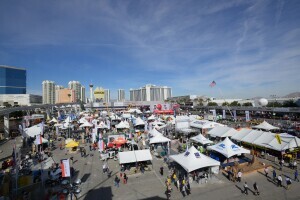 Another World of Concrete is in the books. I spent many hours talking with many people—manufacturers of equipment and materials, association staff, engineers, and, of course, concrete contractors. Tommy Ruttura told us at the Slabs Luncheon to do only the work you are getting paid for—do it well and do it right but as a contractor you’re in this to make money so don’t work for free. Make sure owners know what they are paying for and give them just that. There was a lot of talk about the silica dust regulations that go into force in June. All of the tool manufacturers I talked with—such as Hilti, Bosch, and Minnich—have developed technology to eliminate the dust at the source. Battery technology for cordless tools was also a highlight—new batteries and new tool efficiencies are providing longer run times on a single charge. The new Trump administration and what might happen with infrastructure spending was another topic of conversation and speculation. Jim Toscas, president of the Portland Cement Association, feels that a window of opportunity will soon open when the concrete community can make its case for how new infrastructure dollars should be spent. Although he admits that the different sectors of the industry have different interests, his hope is that we can find some common ground to present to Congress and the administration, especially concerning concrete strengths like life-cycle costs, durability, and sustainability.